After a decade-long journey by the New Horizons spacecraft through our solar system, we can finally add Pluto and its main moon Charon to the roster of large icy bodies whose landscapes we have seen. And it was worth the wait. The first detailed images are surprising, showing a remarkable lack of impact craters on both Pluto and Charon. NASA’s probe passed within 14,000 km of Pluto on July 14, and – after a nervous 12-hour wait for its call home – has begun to send back its trove of data, which includes images revealing details as small as 100 metres across. 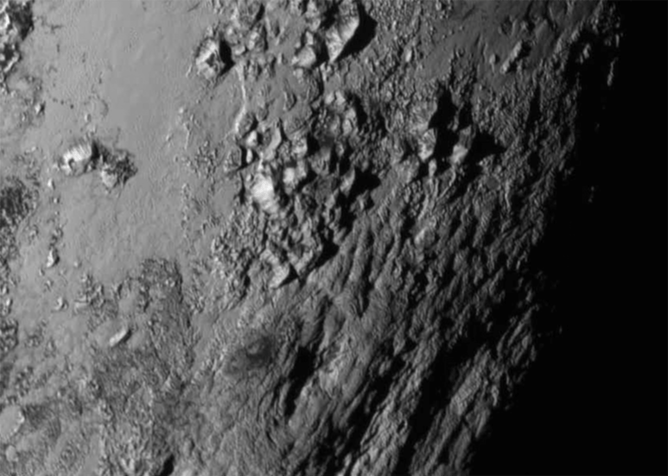 The most detailed image of part of Pluto (see lead image) is truly staggering. Not a single impact crater is to be seen in this region, so the surface must be very young – reshaped by some sort of geological activity such as faulting or icy volcanism. It is rather early to speculate, but maybe Pluto captured Charon only a few hundred million years ago (rather than billions), and we are seeing the effect of the very strong tidal interactions that would have ensued. Pluto could, in fact, even be geologically active today. I watched this image come in via a NASA press conference with a group of colleagues, and we were both amazed and mystified. Pluto – which has a diameter of 2,370km – shares its orbital space with many comparable-sized bodies and crosses the orbit of the giant planet Neptune, which is why it does not qualify as a planet. 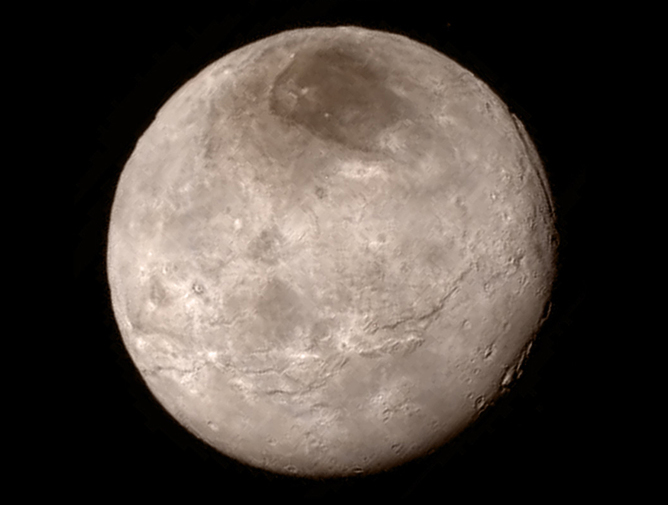 Nevertheless, it is a fascinating world, as indeed is Charon (1,208km diameter). Both are bodies whose rocky interiors are deeply buried by ice of various kinds. There is probably water-ice at depth on Pluto, but the surface ice is a mixture of frozen methane, ethane, carbon monoxide and nitrogen. Latest image of Charon with its enigmatic dark polar cap, and a stupendous fracture system running near to its equator. Charon, with its weaker gravity, has lost the substances that can turn to vapour and escape more easily, and is mostly water-ice tainted by ammonia. That much we already knew. But New Horizons has been gathering data that will show us how these ices are arranged across each surface – and may find traces of other constituents. Pluto (left) and Charon (right) in slightly exaggerated colour. Already the images are throwing up new questions. 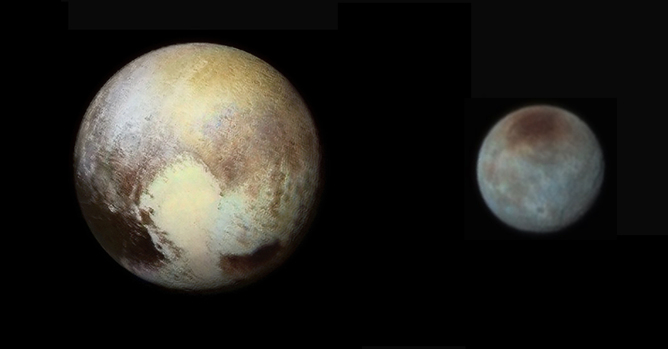 The composite image above, compiled from various images during New Horizons’ approach, shows slightly enhanced colour views of Pluto and Charon. Pluto is notable for patches of both bright and dark material in a belt straddling its equator. What are these? Is the bright, heart-shaped patch some kind of nitrogen frost or snow deposit? Is the dark stuff carbon or tar of some kind? (We know that solar ultraviolet radiation turn methane into tar). Charon, unique among known worlds, has a dark polar cap. Is that old, radiation-damaged methane, whereas the greyer equatorial region is cleaner water-ice? The fact that Pluto has a red tint seems to have been surprising to some, but it has actually been well-known for decades. 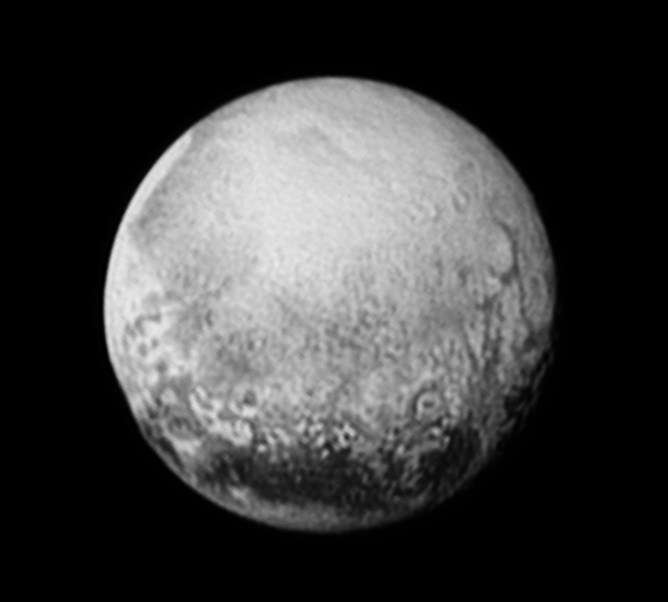 An Open University PhD student has already made a preliminary photogeologic map of the half of Pluto seen during approach (see below). It shows the “heart”, the dark patches and other units in different colours – representing different terrains. Several impact craters have also been marked in green, and a few wrinkles on the surface. A preliminary map of terrain units on Pluto (right), based on the image on the left. Then there are the tectonic features, the faulting or other deformation of the outer layer of a planet, to consider. These are better seen in black-and-white images. For example in the next image, just inside the eastern (right-hand) edge of the disk, the surface is cut by a fracture deep enough to cast shadows. Pluto seen about a quarter of a rotation before the top image. The fractures at the lower right had rotated out of view by the time of closest approach. The ‘heart’ was just beginning to rotate into view on the left. Charon and Uranus’s moon Titania at the correct relative scale. They both have fractures visible near their right-hand edges, which could be a remnant of a time when the surface became broken, perhaps by tidal forces. 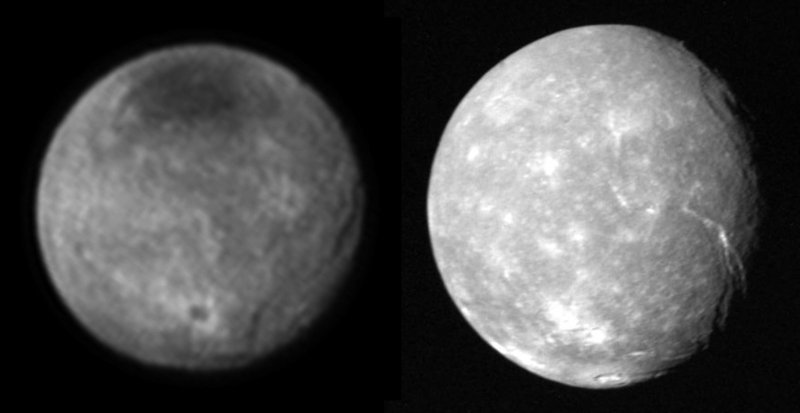 Fractures can be seen both on Charon (left) and Titania (a moon of Uranus). Scientists are eagerly awaiting more data from New Horizons’ onboard memory, which is now nearly full, that will take a total of 16 months to transmit to Earth. This is because at a range of more than 4.6 billion km from Earth the signal is so weak that it has to be transmitted at a slow rate of about 1 kilobit per second (you may be reading this via wi-fi operating at tens or hundreds of megabits per second). Although we may have to wait a while before we see the best of the pictures, what we already have already seen is enough to greatly intrigue planetary scientists such as myself.